Now I have been looking forward to this wedding for the past 9 months. All I have to say is WOW! We took tons of photos and all the video clips are blog worthy as well. If anything, I had trouble deciding what to talk about for Stacy and Davids Caribbean Style Wedding Reception. 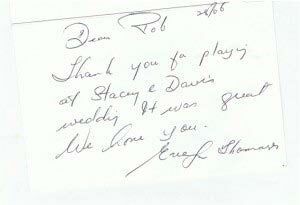 I also got a nice thank you card from Evelyn, mother of the bride… She is such a sweetheart! The funny thing about the note is that she wrote down my name as “Rod”, when it’s really “Rob”. They had their reception at Mystic Creek in Milford Michigan. For those of you who do not know, Mystic Creek is inside camp Dearborn. They had fire works on this night while the dance floor was packed. It was a really nice touch to see the sky light up as guests swarmed the dance floor. Guests just couldn’t stop dancing to soca. Even though only half the guests were carribean it didn’t matter, everyone loved the music. The cake was beautiful, in the photo above it almost didn’t look real. The flowers were so bright that it seems like it was creaetd in photoshop. The family was very friendly and they packed the place with almost 300 guests in attendance from all over the country. Of course, no Caribbean style wedding reception would not be complete without Pan music. The person that played the steel drum was all the way from Vancover. He did a full hour during the cocktail portion of the reception. What we did was play the instrumental version of a Caribbean song and he would improvise. Some guests were even taking out their cameras and recording video clips of him on the steel drum. Besides Reggae and Soca, we played a variety of music. The wall lighting looked so good behind the head table. We used about a dozen room lighting fixtures throughout the banquet hall and it created the perfect vibe in their space. It made for one awesome backdrop once the dancing started. I hope my wedding is this fun, and if you are looking for wedding DJs in Milford, then check our availability on the right! We are looking forward to meeting with you and finding out what exactly you are looking for in a wedding DJ. 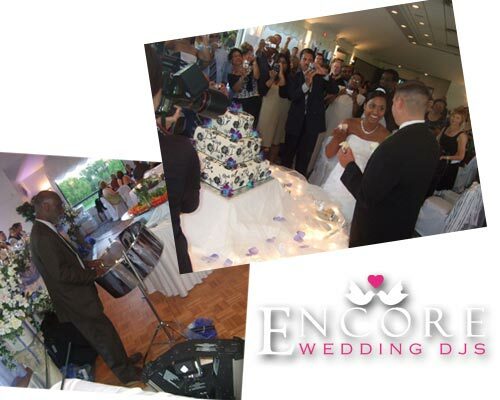 Besides disc jockey entertainment Encore can also help you with other aspects of the big day.